Fast, Economical Repairs. Don't put it off any longer! Call Us Now! 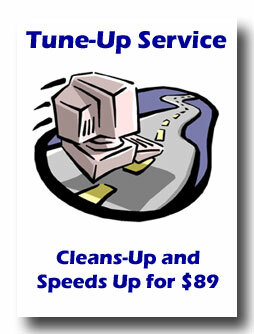 BEST VALUE $99 - Full Computer / Laptop Tune-up. "Bring your Computer or Laptop back to life and avoid expensive repairs"
Adware, Spyware, Scareware, Malware and Viruses are all picked up from the Internet and really slow down your computer or worse, they can compromise your on-line security allowing confidential account numbers, usernames and passwords to be stolen. We will go thru your entire hard drive searching for and removing Adware, Spyware, Malware and Viruses. We can not guarantee that this flat-fee service will totally remove all these threats but 80% of the time it does, additional services and charges are sometimes required. We will install a free AntiVirus program if yours is not current. Over time Windows XP, Vista and 7 gets all tangled up and becomes inefficient. We will run numerous maintenance tools to check, cleanup and reorganize the system, registry and program files on your computer to optimize performance. Excessive heat is the #1 cause for expensive computer and laptop damage. We will physically clean out the computer dust and check the cooling system to lower the operating temperature. This entire process takes several hours in our shop. Typically you would plan on 3-4 days in our shop. 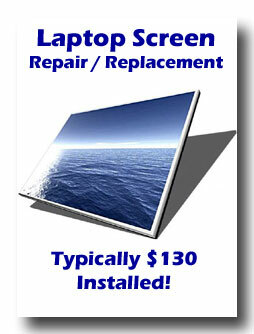 $75 - Hard Drive Erase and Complete Reload and Updating of your Windows. Would you like to get your computer running as fast as it did when you first got it? Some Virus and Malware problems or simply un-fixable. Drop off your computer along with your complete set of Windows and Mfg Restore disks that came with your computer and we will: backup your common data files if possible; run the ’Restore’ process that erases your hard drive and completely reloads your Windows; reinstall all programs that came with the computer; and then restore your common data files. The Good News is that all problems get erased from your computer, The Bad News is that some programs and data that you have added may get erased from your computer and need to be reinstalled. However, the process can still be very rewarding! $60 - Hard Drive Upgrade Service. Do you need or would you like additional Hard Drive space to save more Photos, Music, Videos and or Data files? We can upgrade your computers hard drive to provide more storage space and newer hard drives are often much faster then old ones. Bring your computer in, we will lookup the proper new Hard Drive for it, order in the new Hard Drive (if we do not stock it), and then install it in your computer and copy all contents from your old hard drive over to the new hard drive. You will also have the additional Hard Drive cost which is typically $100 or so. $30 - Backup Automation Setup. Bring us your computer and your external hard drive or usb drive and we will create a custom automated program on your computer to backup all your critical data files and user settings. Setup to run on each computer start up, shut down or by clicking an icon whenever you like. 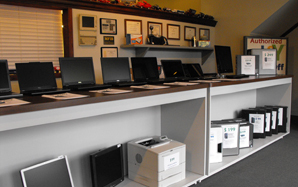 DaytonIT Computer Shop shop located in Centerville, Ohio. Serving the greater Dayton Ohio area including Beavercreek, Bellbrook, Kettering, Lebanon, Mason, Miamisburg, Springboro, West Carrollton, West Chester and Waynesville.